There are a couple of innovations found on T201 cards that would show up again in future sets. First, the idea of featuring two players on a single card who shared a picture showed up in the 1955 Topps Doubleheaders set. Second, a line of statistics appears on the back. Up to that point, card backs normally included advertisements and little else. The cards were inserted into packages of Mecca cigarettes. A total of 50 cards (100 players) make up a complete set. While the name Mecca has a Middle Eastern flavor, the brand was part of the American Tobacco Company. The first part of the Twentieth Century marked an increased demand for Turkish tobacco among consumers and the Arabian names were concocted to help spur sales. Many of these names are familiar to collectors: Fez, Turkey Red, Hassan, Fatima, etc. 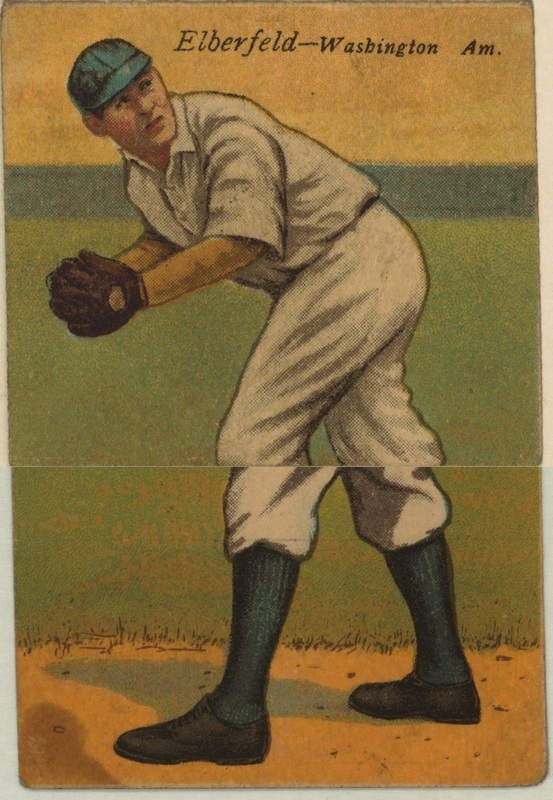 Card fronts show a lithograph painting of a player in action, with his name and team city printed in the top left corner. On the back, part of another player picture appears that can be flipped over onto the other picture. The rest of the back shows player statistics and an advertisement for Mecca cigarettes. The cards are unnumbered. Card pairs generally pair up teammates. In some cases, both players are Hall of Famers. Ty Cobb and Sam Crawford make up one HOF combo, as do Cub infielders Johnny Evers and Frank Chance. However, the toughest card in the set features two common players, Patsy Dougherty and Harry Lord of the White Sox. The card below was downloaded from the Library of Congress. The three pictures show the front of the card, the back of the card, and the final pictures of Kid Elberfeld when the card is folded. George Florian McBride (1880-1973) was a clutch-hitting shortstop who played for four different Major League Baseball teams in the first half of the 20th century, and in 1921 succeeded Clark Griffith as manager of the Washington Senators – becoming only the second manager in that team’s franchise. McBride made a brief three-game appearance for the Milwaukee Brewers (1901), managing only a dozen at-bats before heading to the minor leagues. When he returned to the MLB, McBride signed on with the Pittsburgh Pirates (1905) before being traded mid-year to the St. Louis Cardinals (1905-1906), where he served primarily in a supporting role. McBride finally gained some recognition as the everyday shortstop with the Washington Senators (1908-1920), where he batted .221. Perhaps his best season came in 1911, as he batted a career high .235 with 58 hits and 59 RBIs. He also led the American League in fielding for four consecutive years (1912-1915). As manager of the Senators (1921), he took the team to an 80-73 record, but was forced to retire after he was struck in the face toward the end of the season, resulting in partial paralysis. A lifetime .218 batter, McBride had 447 RBIs with seven home runs during his professional career. Norman Arthur “Kid” Elberfeld (1875-1944) was dubbed “The Tabasco Kid’ for his fiery play and fierce competitiveness defending the shortstop position. Elberfeld was said to pour whiskey into the spike wounds on his legs (cauterizing them) caused by aggressive base runners that slid into second, spikes up. Kid Elberfeld played 14 seasons for the Phillies (1898), Reds (1898), Tigers (1901-1903), Highlanders – would become the Yankees (1903-1909), Senators (1910-1911) and Robins (1914). Kid was the starting shortstop for the Detroit Tigers in their inaugural season and the next. His hit temper often got Elberfeld in hot water with opposing players and umpires, often verbally and/or physically assaulted them during games. In 1905 as the Highlanders shortstop, Kid dug his knee into the neck of Detroit rookie Ty Cobb as he slid headfirst into second base, driving his face into the dirt. Cobb never again slid headfirst into second base. Elberfeld also showed no fear at the plate and led the league in hit-by-pitches twice (1903, 1911) in his career while being among the league leaders in every other seasons. Kid Elberfeld retired with a .271 career batting average with 1,235 hits, 647 runs, 213 stolen bases and 535 RBI. After retiring from everyday play, Kid became a hotheaded minor league manager, primarily for the Chattanooga Lookouts and the Little Rock Travelers, until 1936. Set Description: Mecca cigarettes distributed this card in 1911. The cards show two different players sharing the same legs. Open is one and folded reveals another. They are lithograph prints and for the first time they showed statistics of the players. T201- Double FoldsThese cards were found in packages of Mecca cigarettes they feature one player when the card is open, and another when the card is folded, both players sharing the same pair of legs. Mecca Double Folders measure 2-1/4" by 4-11/16." The fronts are color lithographs with the player's name appearing in black script in the upper left. The backs are printed in red and contain player statistics. The 50-card set contains 100 different players including 20 of Hall of Famers. The Mecca Double Folders, with two players and statistics were one of the most innovative of the tobacco card era. Due to the 2 player per card and way the card is folded this set is not recommended for team collecting.